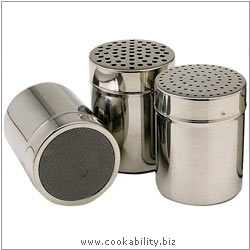 Stainless steel shakers. All versions complete with stay fresh plastic lid. Medium hole for chocolate powder and spices. Fine mesh for flour, icing sugar, cocoa powder and powdered spices.